The entertainer’s kitchen must meet a long list of requirements: it must be highly functional and spacious, allowing the cook to work freely while engaging their guests. The entertainer’s kitchen must meet a long list of requirements: it must be highly functional and spacious, allowing the cook to work freely while engaging their guests. It must be a place where the host can serve hors d'oeuvres, keep an eye on the masterpiece simmering on the stove, and catch up on the latest gossip all at once. It must be a space that lends itself to both bustle and rest. 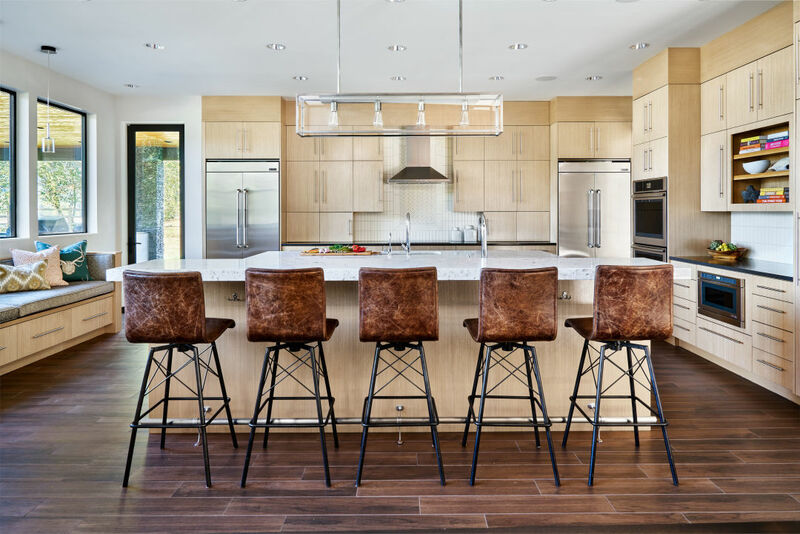 The kitchen in Garrison Hullinger Interior Design’s Yale Lake house is the perfect entertainer’s kitchen. The Yale Lake kitchen greets guests with ample seating and natural lighting. Photo by Blackstone Edge. The Yale Lake kitchen is open to the entire home, providing direct view and access to everywhere guests might congregate. A host at the kitchen sink has the ability to see and hear family and friends in the dining room, great room, and outdoor entertaining space. A built-in seat next to the kitchen provides a comfortable spot for a guest to curl up with a glass of wine and enjoy the view of the lake and the company of her host. The Yale Lake kitchen is the perfect space to create meals, but it is a destination all on its own. 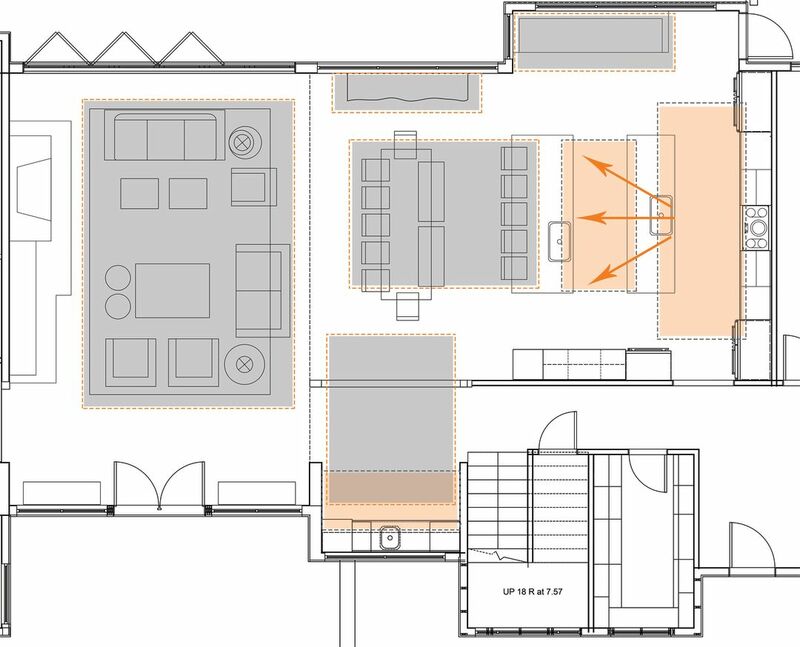 Work space (orange) and gathering space (grey) stay separate for happy hosts and relaxed guests. Adapted from a document produced by Garrison Hullinger Interior Design. The intelligent design of the kitchen means that work space and entertaining space rarely overlap - with double islands, there’s room for guests to settle in without getting in the cook’s way. The “work zone” in the kitchen allows a host to create a gourmet meal unencumbered by guests. Photo by Blackstone Edge. 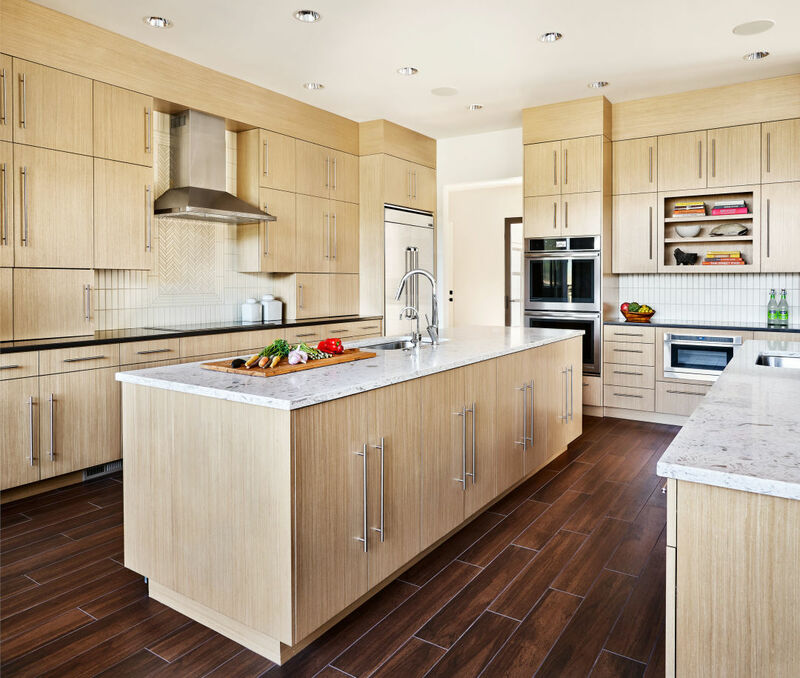 It’s not just the layout that works hard for the host - the kitchen’s appliances and finishes include double sinks, double dishwashers, and stain-resistant quartz countertops make tidying a piece of cake. With double French top refrigerators roomy enough to hold several trays of food, this kitchen is ready to handle any party the host can dream up. The raw edge wood bar countertop provides visual interest and a useful spot for gathering. The porcelain tile floors tie the entire space together. Photo by Blackstone Edge. Yale Lake isn’t just a home where it’s a joy to host - it provides gorgeous spaces for guests to gather. 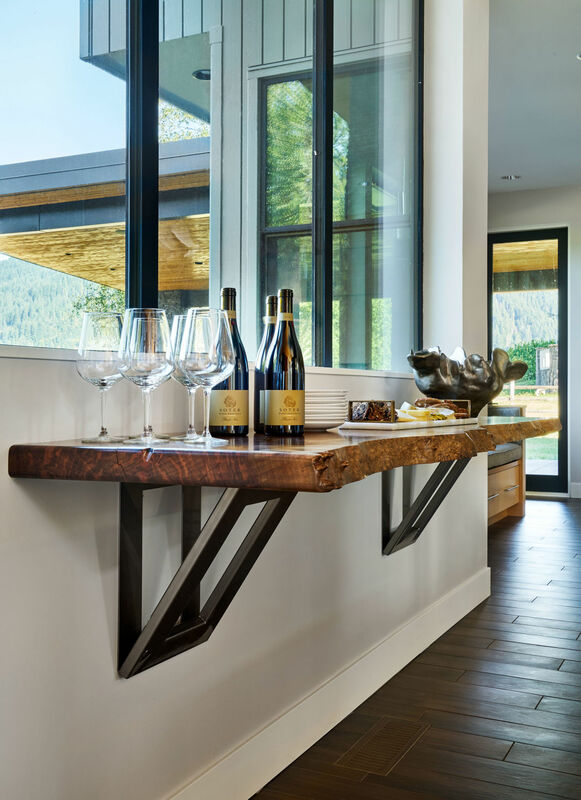 A wood bar countertop is the perfect out-of-the-way spot to set down a drink or pick up a snack while looking out on the spectacular landscape. The dining room and adjacent wet bar lets guests serve themselves. Photo by Blackstone Edge. The spacious dining room and adjacent wet bar creates a separate space dedicated to beverage service and entertaining, and makes it easy for guests to refresh their drinks and select the clearest, most perfect ice cubes for their cocktail without wading through a crowded kitchen or interrupting a busy host. The entertainer’s kitchen must create a space that suits hosts and guests alike. To achieve this, thoughtful, client-centric design is essential. Garrison Hullinger Interior Design is committed to creating beautiful spaces that are perfect for the lifestyle of the client. Yale Lake is made to entertain, and it looks great doing it.